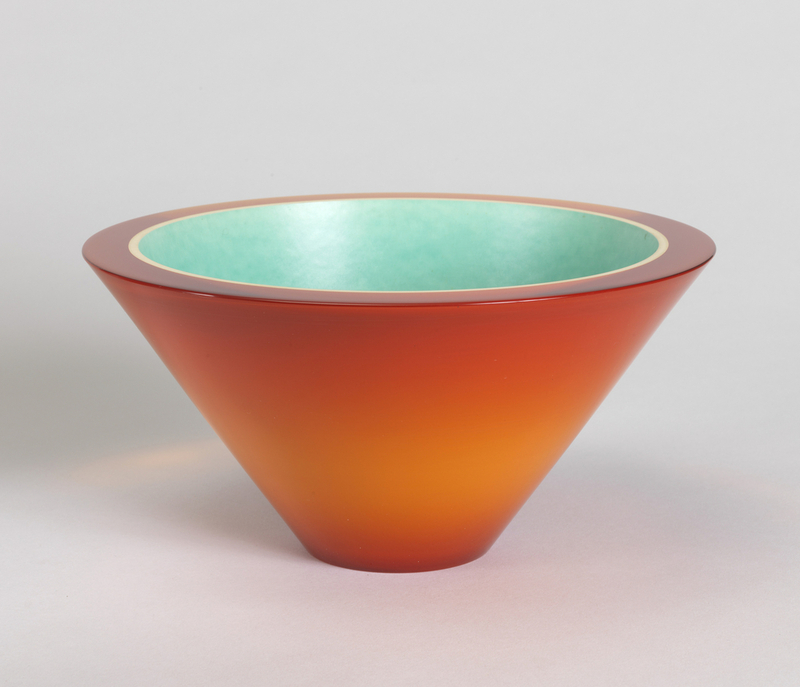 This bowl sends a colorful optical jolt by balancing complementary hues; the red-orange of the exterior against the turquoise of the interior. The interplay of the warm red-orange and the cool turquoise results in visual excitement as the eye shifts back and forth between the two. Adding to the interplay is the juxtaposition of the two media, polyester plastic and porcelain. The bowl is configured from a polyester outer shell and a porcelain liner. Its smooth straight sides flare outward at an extreme angle terminating in a flat, broad rim that reveals the different layers of materials. The color interaction is created by layering and bonding cast, transparent orange polyester with the white porcelain liner, its interior wall glazed turquoise. Dutch designers Bart Guldemond and Vincent de Rijk experimented with new techniques, searching for ways to bond various materials to ceramic. They eventually succeeded in enveloping a ceramic bowl with polyester resin. De Rijk, who earned a degree in industrial design from the Design Academy Eindhoven, is a well-known architectural model maker. He developed a variety of model-making techniques that utilize plastics, specifically the casting of polyester, in which he is an expert. Guldemond, another graduate of the Design Academy Eindhoven, started his career working with de Rijk, setting up a ceramic workshop in Rotterdam. He founded his own design practice in Amsterdam in 1990. Spatial context plays a crucial role in his work. The broad interests and talents of these two designers, as well as their perseverance in problem solving led to the technology needed to create this bowl. Their understanding of color theory resulted in a project that shows ingenuity as well as colors that seem to burst with life. Susan Teichman is a design historian specializing in jewelry and the architectural history of synagogues.